Hospitals are widely regarded as a complex building type, and, consequently hospital design and engineering is a specialised endeavour. This is important to be aware of, because, provision of good infrastructure in the context of healthcare service delivery can literally be a matter of life and death. For example, if the hospital power supply is interrupted - even for a short period of time – and there is not a well-conceived redundancy plan, failure of mechanically ventilated breathing apparatus could result in asphyxiation, patients on the operating table could be left vulnerable and lifts could stop, delaying patients on their way to receive critical care. This seems fairly obvious. Yet, observations in the field show that, all too often, insufficient care is taken in the planning, design, engineering, operation and maintenance of hospital infrastructure. The World Health Organisation notes that, globally, at least 10% of hospital admissions result in adverse events which see patients, staff or visitors being injured or contracting an illness they did not have before entering the facility. Hospital design, engineering and specification is not the only factor, but research has produced an evidence base to show how they can contribute positively to safety, health and healing. Here are just four of the many ways informed specification can reduce risk and result in better healthcare built environments. Good hospital design should balance the need for the building fabric to be loose-fit and adaptable with a need to support highly specific and specialised procedures. Did you know that, internationally, clinicians are always taught to approach from the patient’s right-hand side when doing general clinical procedures, such as taking vital statistics? The set-up of examination beds and all the medical paraphernalia in consulting rooms needs to be fit-for-purpose and support this clinical process, as shown in figure 1. A room with a similar – but mirrored layout, as shown in figure 2 – is likely to be unacceptable. Wash-hand regimes and the requisite infrastructure are a critical cornerstone of infection prevention and control in any hospital setting because many hospital-acquired infections are transferred by hand from one patient to another. Yet, uninformed wash-hand basin and tap selection or poor installation can actually contribute to hygiene problems and the spread of disease. A clinical wash-hand basin should therefore be preferred over a “normal” wash-hand basin. 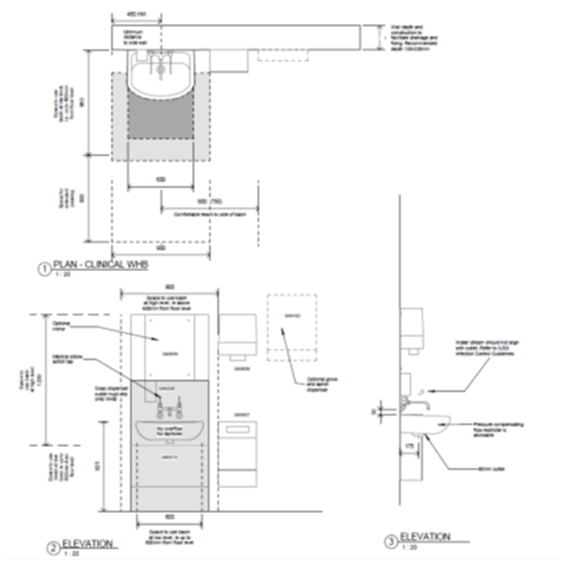 So what are the distinguishing features of a clinical wash-hand basin? From figure 3 (below), it can be seen that a clinical wash-hand basin does not have an overflow or tap-holes, that it is not a drop-in or counter-top unit. The water stream from the taps must be aimed to avoid falling directly into the outlet. Pressure compensating flow restrictors are advisable. These features allow for ease of decontamination and helps avoid biofilm developing, which can harbour harmful microorganisms. In at least one case study microorganisms were aerosolised, contaminated nearby items which were then implicated in transfer to multiple patients in the unit, causing infection. Ergonomics matter. The taps of a clinical wash-hand basin are levers operable by elbow action, so that direct hand contact is avoided. Soap dispensers should be positioned so that spill falls onto the basin. Paper towels dispensers and disposal points must be provided. Glove and apron dispensers are sometimes needed, but all of these should be positioned within easy reach of the hand-washer, and as far away from the area of water aerosol generation as practicable. A splash back is needed which is impervious, fully-washable and with as few joints as practicable. Gaps between the wash-hand basin and wall should be sealed. A mirror is generally discouraged – especially in mental health and reconstructive surgery units. Research has shown that providing basins in convenient locations, and in sufficient numbers is key to staff making use of them, but, plumbing which is only used infrequently is prone to shelter legionnaire’s disease, so design (and operation) should seek to avoid water storage of between 25 and 42 degrees C.
Typically hospitals must make provision for patients to move from one part of the hospital to another on a bed or by wheelchair, or who may not be sufficiently mobile to tackle even modest stairs. Goods are often conveyed on wheeled trolleys. Design needs to apply the relevant ergonomic principles, to ensure that corridors and doors are wide enough, lifts are big enough, ramps are gradual enough, and amenities are universally accessible for effective, safe movement of people and the necessary goods. Compressed gas is useful for a variety of purposes in hospital settings and can be fixed and piped in the very fabric of the infrastructure or mobile and deployed to where it is needed. Only suitably qualified and skilled professionals should work on these installations and designers and engineers must work closely with healthcare service providers to understand their specific needs, and follow applicable standards and regulations. All compressed gas cylinders (regardless of size) need to be secured to racks, walls, work benches, or trolleys by means of strong chains or straps because they can injure persons if they fall over, and they can become dangerous missiles if they are damaged. Gas which becomes contaminated (say, with moisture) can cause death if dispensed to patients. The foregoing four essential tips provide some small insight into why hospital design and engineering can be both fascinating and intimidating. Luckily, there is plenty of guidance freely available – much of it mandatory. For example, find the IUSS (Infrastructure Unit System Support) suite of documents online at www.iussonline.co.za . If healthcare architectural design and engineering interests you, consider joining the South African Federation of Hospital Engineering, known as SAFHE, the voluntary association for built environment professionals of all disciplines, healthcare managers, clinicians, health planners, and more. See www.safhe.co.za for more.